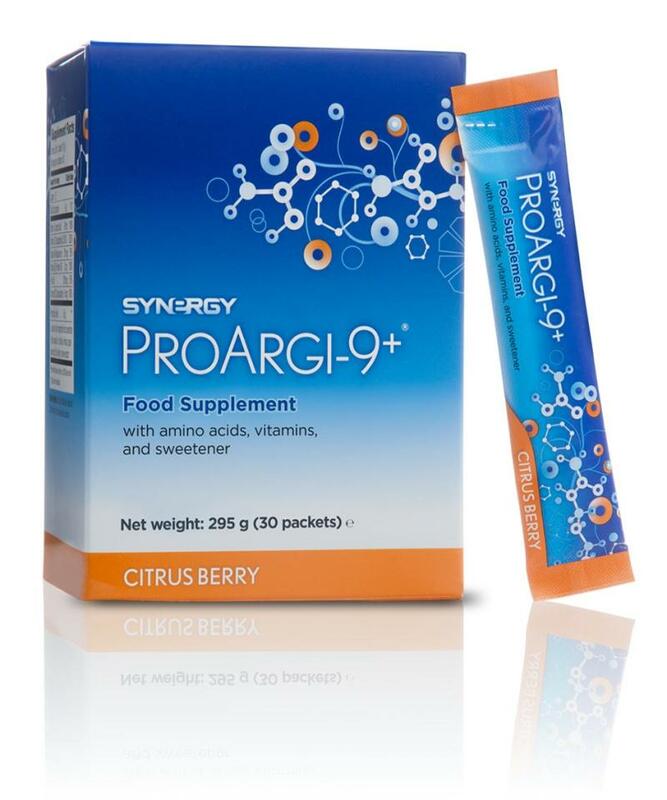 ProArgi-9+ is Synergy's top-selling product and the cornerstone of any nutritional regimen. ProArgi-9+ is packed with pharmaceutical grade L-Arginine, an amino acid that your body converts to NITRIC OXIDE to help enhance your cardiovascular system. L-Arginine found in ProArgi-9+ is the only known precursor to Nitric Oxide. Without Nitric Oxide human life is not possible. Scientists call it the “Miracle Molecule”. When starting Pro argi-9 plus for the first time it is recommended to start slowly and build up as the system needs to adjust to the extra nutrition. The best times to take it is first thing in the morning and last thing before going to sleep. Start off with a 1/2 sachet of ProArgi-9 in a 250 ml or more glass of water. Mix well until it is completely dissolved and drink. It is best to avoid eating or drinking anything else for at least 45 minutes to let the body absorb it without anything else competing for absorption. That night going to bed on an empty stomach [ ie not having eaten for at least 2 hours ] mix the other 1/2 sachet into the same amount of water and drink it just before you go to sleep. If you read a book or watch tv in bed bring the pro argi-9 plus with you and only drink it after you have done those things. After 2 to 3 days of doing this without any problem start to increase the dosage to the full sachet in the morning per day. Each sachet of pure elemental grade arginine and the body needs at least 5 grams to cause vasodilation and the therapeutic effect. The more arginine the faster the results. This is only a food and therefore it does not contraindicate with medication. If you want things to happen faster take more. A good therapeutic amount would be two scoops twice a day for about three months to get things started and then gradually lower to your maintenance dose. Everyone is different and has to find the maintenance amount for them by trial and error. Some people will also experience what they would call side effects like a bit of pressure in the head like a headache. This is increased oxygenation of blood flow to the brain. It will go away when the body gets used to it again. This may also happen in any part of the body as the blood flow increases.